4.5 Why can't I connect to my dstore server started with server.sh? 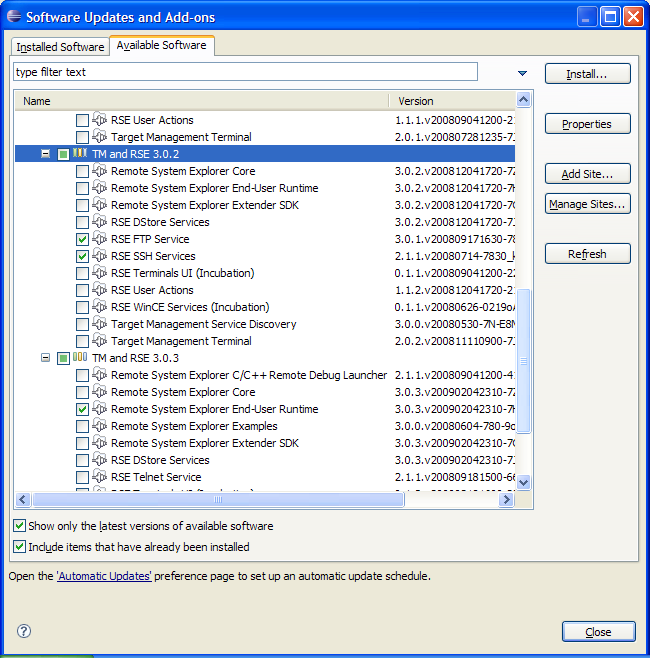 5.2 How do I use eclipse to develop Target Management plugins? Note: The packages libssl-dev and uuid-dev must be installed for the org.eclipse.tm.tcf.agent plug-in to compile properly. Note: Version 3.2.1 apparently subsumes a lot of the components shown below into its core; they are no longer visible. The dstore server uses the auth.pl to do the authentication. auth.pl uses Shell.pm, which is not installed by default by many distros (e.g. Debian). Try running perl auth.pl. If you get an error saying that it can't locate Shell.pm, install the necessary packages; e.g. libshell-perl for Debian. How do I use eclipse to develop Target Management plugins? The self-hosting instructions explain how to use eclipse to develop TM plugins. NOTE: When you cloned via git protocol you will have read rights to the repository, but you will not be able to commit any code. See #How do I submit a fix for a bug? below for how to contribute back your changes. We are always keen to get contributions beyond simple bug fixes as well. But since we need to remain within our charter, and make sure that all code coming from Eclipse.org is really clean in terms of IP and legal / copyright issues, we need to be a little bit more careful with substantial contributions (exceeding 1000 lines of code and documentation). This page was last modified 07:53, 19 July 2016 by Moritz "morty" trübe. Based on work by Benjamin CABE, Anna Dushistova and Roland Schulz and others.